On 17 May 2016 Google rolled out a number of changes to how the search engine handles structured data on the web. Among the most important of these changes are the introduction of a new rich results type, Rich Cards; the complete restructuring of its documentation about structured data; and the addition of a new report in Google Search Console, the Rich Cards report. This follows closely on the heels of changes made to Google's Structured Data Testing Tool just a few days earlier. Let's take a closer look at some of the more significant of these changes, and what their implications might be for a site owner's search visibility and search engine optimization efforts. In a new page on search features, Google introduced the term "rich results", a catch-all phrase for instances where attributes about some thing represented on a website "can be featured in a visually compelling way." These "rich results" are facilitated by the addition of structured data markup to web pages, either in the form of content items ("such as articles, recipes, or movies") or lists of items ("such as recipes and events). This is the first time Google has made the differentiation between "content items" and "lists of items", and it relates to another concept introduced by Google in their revamped documentation, that of a user's search intent driving presentation. When you prepare your content for inclusion in Search, it can appear in a variety of visual forms, because it’s the user’s search intent that determines how Google Search displays information. A user’s search intent is a concept describing how our algorithms understand what the user really wants with a specific query within a specific context. For example, if a user queries for “turkey,” the search intent is ambiguous, so our results will display a mix of items, including a Knowledge Graph card about the country of Turkey, news items on Turkey, and turkey as a kind of fowl. However, if the query changes to “turkey recipes,” the search intent narrows to a list query, so a carousel of recipes helps to cluster related recipes together, including a summary carousel for recipes from various providers and a host carousel for recipes from a specific host. "Cluster" is the key concept here. Google has now explicitly stated that it will make efforts to group results together when it ascertains that the search intent is for a "list query." And this is a good segue to the concept of a "card", and the environment that gave birth to it – the mobile web. A card, Google now tells us, "is the fundamental presentation unit for Search results. It appears in the organic results for Google Search either as a single element or a list of elements." Note here we're talking about cards, not rich cards. Like everything else in the new search guides, the nomenclature here draws heavily from the language of mobile. These, for example, are cards returned for the query "red wine." In other words – as far as I can judge – "cards" are search result items in mobile, which we used to call a search snippet. On desktop, indeed, one might still call these "search snippets", but its revised documentation and examples for structured data Google has essentially banished the concept of desktop results. Or will we still be talking of "search snippets" in a week's or a month's time? There have very recently been multiple sightings of mobile-style cards appearing in the desktop results, such as those you can see in this screenshot provided by Jennifer Slegg in an article on the SEM Post. If indeed a card is "the fundamental presentation unit for Search results" then this may be less of a test than a preliminary rollout. And while I may have been premature in tweeting "Rich snippets RIP" (they are still mentioned tangentially in the documentation, and the rich cards announcement FAQ gleefully provides the answer "Yes, you can!" to the question "Can I keep my existing rich snippets markup? "), rich snippets themselves may soon be a thing of the past – if only in name, as conceptually this type of rich result lives on in the form of rich cards. 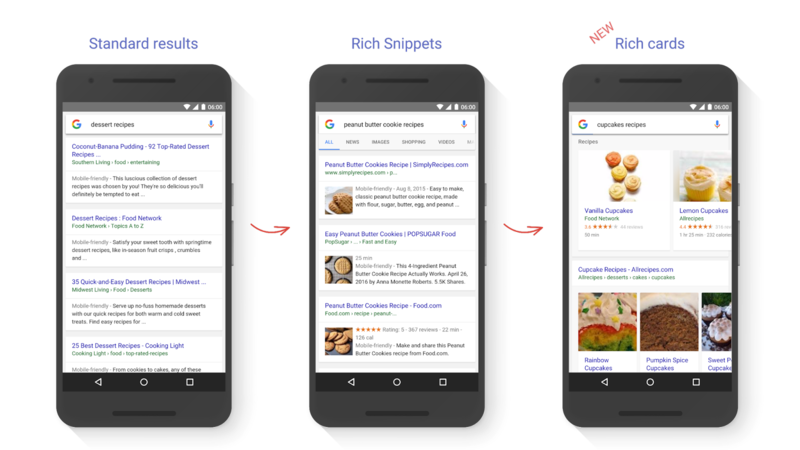 Which brings us to Google's main announcement about these changes, the introduction of rich cards – "a new Search result building on the success of rich snippets." And, in essence, rich cards (as evidenced by Google's "evolution" graphic in their post) are rich snippets re-imagined for the mobile web. Google's has now started showing two types of rich cards: movies and recipes. Here's a current recipe rich card. It's actually more accurate to say "here are current recipe rich cards" as what's pictured are multiple cards shown in a carousel. And in some ways, thinking of the "list query intent" discussed above, one might be tempted to say that a rich card is "a rich result that can be displayed in a carousel." But rich cards can also be displayed as single items. When it comes to movies, however, color me confused. At present every single movie I search for returns ye olde Knowledge Panel (now a "Knowledge Graph card"), and no result bears any resemblance to the movie rich card previews provided by the Structured Data Testing Tool, as we'll see later. As per the use cases listed the TV and movies data type page, one of the benefits of adding structured data to a movie item is to facilitate its inclusion in a Knowledge Graph card's streaming options, but this isn't a "movie rich card." And in both the announcement post and in the structured data documentation there's no movie rich card to be found. However, movie rich cards will, apparently, one day appear in a host-specific list carousel (currently in "experiment mode" where you can test your markup for errors, but where the cards themselves aren't yet available in the search results). Which brings us to the next new feature Google announced, host-specific lists. UPDATE: A few hours after this post was published Google's Richard Gingras, in his I/O talk on "Search and the mobile content ecosystem", shared an example of a movie host-specific list on screen. A host-specific list, as the lists specification page explains in reference to recipes, displays "cards from a single site within a specific category." Here, for example, is host-specific recipe list for curry recipes on the Food Network's website. As you can see, these results are returned a carousel. Host-specific lists for events are provided in a more traditional "list" format. As already noted, movie host-specific lists aren't yet available but are coming sometime soon. And I expect we'll see more types of host-specific lists in the future. Mobile has really opened up opportunities here for Google to innovate with the presentation of search results, as the availability of carousels and lists within rich cards mean they're no longer faced with the conundrum of sacrificing host diversity by presenting a SERP with results all from a single site: those single-site results can be relegated to a carousel, with more diverse listings below. Announced in concert with rich cards is the addition of new rich cards report within Google Search Console. The new report (which complements rather than supersedes the structured data report) displays errors that render a page ineligible for a rich card ("invalid cards"), cards that are "fully enhanced", and "enhanceable cards" – cards that "can be enhanced by marking up additional fields." Google also promises that a new "rich results" filter in the search analytics report "will help you track how your rich cards and rich snippets are doing in search: you’ll be able to drill down and see clicks and impressions for both." This feature is currently being tested in a closed beta. As per a post from Google Webmasters on Google+, AMP reporting has been added to the search analytics report on Search Console, but this doesn't pertain to structured data usage specifically. More important in that regard is the 4 May 2016 update announced by John Mueller, in which AMP error information is now aggregated – and this error reporting includes structured data usage. As noted in these pages, Google has slowly but surely making improvements for their support for JSON-LD. With these latest changes they're all-in when it comes to favoring JSON-LD for the markup that uses the schema.org vocabulary. The announcement post states that "[w]e strongly recommend using JSON-LD in your implementation", and the new introduction to structured data page reiterates this recommendation, noting (correctly) that "[s]tructured data markup is most easily represented in JSON-LD format." A table on that page shows that JSON-LD is now supported by Google for "[a]ll public data types except for Breadcrumbs." However, it's worth noting that, despite this recommendation, microdata and RDFa are still supported for all data types, and there's no suggestion that support for these syntaxes will be deprecated. As noted above, the Google Structured Data Testing Tool was revamped just prior to the rich cards announcement and redesign of the structured data document changes. I wrote about those changes in some detail, so won't repeat the information I already provided in that post. One thing I didn't notice, however, is that there is limited rich card preview functionality in the revamped Tool. The announcement notes that you can now see a preview "of how the rich card might appear in Search (currently available for recipes and movies)." Rich snippet previews were available in the first version of the Rich Snippets Testing Tool, but haven't been provided since the tool was redesigned in January 2015. You can trigger a "preview" button by running the first data type example code for recipes or movies through the Testing Tool. And here's what a recipe rich card preview looks like. Okay, almost like that: I must confess that I overlaid the image on that screenshot. The actual preview, even though I've declared the image you (which is available at a Googlebot-accessible UR) looks like this. This is because, as the new help article on the Google Search Preview Tool explains, "you can see your actual image in the preview if we confirm, or verify, that the image URL is in our index", and the asset I've used here hasn't yet been indexed by Google. Based on that, and the help page's note that "[i]t helps you preview your structured data markup for web or mobile app URL as it would appear in the Google Search results page" (emphasis mine) It's likely that we'll see the functionality of this tool expand in the future. Google has completely reorganized how they provide information about structured data use, specifications for specific types, and examples of structured data markup. Previously, all information was provided from a single hub page on Google Developers. Now all things related to structured data appear on the Google Search site. The most notable change is that informational pages are now separated from pages about specific item types. Here are the most notable pages in the reorganized presentation. Guides and usage specifications for structured data, indexing and page creation. Includes the new search features page, which gives an overview of rich results type, and the new search gallery, which provides images and code examples for a handful of rich results types (four at time of writing: recipes, events, products and reviews). The hub for individual data types that are eligible for rich results, such as reviews, events and recipes. These were previously served from the single documentation hub on Google Developers, under the heading "Enable Rich Snippets." The new way of organizing these items is much more extensible. A new holding area for data types that are being piloted "with a small set of initial providers." Currently the features listed there are live blogs and software apps. Information on the Search Preview Tool, as mentioned above. Worth calling out in this list because, as far as I can tell, the link to this page is exposed only after you click the "preview" button in the Structured Data Testing Tool for a type that's eligible for preview. For articles it's worth noting that the prior pages for "Top Stories with AMP" and article rich snippets have been combined into a single articles page, reflecting the move to organize structured data documentation around data types rather than rich snippet types. The way in which example code is provided has changed too. Previously code was provided on each specifications page inline. As per the image above, code examples are now linked by a "see markup" button, which opens the code example directly in the Structured Data Testing Tool (though there is still some inline code provided for the local businesses data type). This doubtlessly makes example management easier for Google, and certainly now relieves users of the burden of copying and pasting code into the Structured Data Testing Tool. And, unlike before, the examples provided mostly come back as error-free in the Structured Data Testing Tool. Current exceptions are an aggregateRating example that, bizarrely, declares something named "Super Book" as a Thing rather than some more specific class (declared as such in examples for all three supported syntaxes), a VideoObject example where the thumbnail URL provided is not valid, and a MusicGroup example where the content declared by and event property is a URL, rather than the Event type that is expected. Finally, while this isn't new, it's worth noting that all of Google's structured data guidelines and documentation reference schema.org, and only schema.org. Google has gone all-in with the vocabulary as the basis for structured data markup they support, just as schema.org's fifth anniversary approaches. Great article – simple the best details on the topic. And very interesting that you noted how close it is to schema.org’s fifth anniversary – I hadn’t thought of that. Agreed – Jarno van Driel is a guru at this! Great post. It will be good when GoogleBot starts supporting JSONLD for ‘custom potentialActions’ rather than the whitelist of actions. Also customAttributes or value-pairs for reciepes is interesting too. Insightful content and couple of important points are noted form here. I have always been a great fan of structured data, especially Schema. Now this newest development at Google, makes it more interesting and obviously it needs more good articles/ documentations like this one. Thanks for sharing this here with us. I have several search console properties that I manage for my clients. All have rich snippet results for at least one product. I have yet to see a product card show up in the cards section. The two items missing are brand and model. I did not see those in the documentation as being essential. What is your take, Mr. Bradley? Hi Denver, thanks for your question. Well, as at time of writing Google has officially announced two rich card types: movies and recipes. There is as yet no product rich card, only product rich snippets. So I wouldn’t expect a product rich result to appear in this report until such a time as product rich cards are supported; as you doubtlessly know, rich snippets are not included in this report (although they may appear in the new “rich result” filter in the Search Analytics report, which doesn’t specify which type of rich result was generated). Thanks for this wonderful piece of article. Could someone please tell me how can we create these Rich Cards for the websites. If someone can add a youtube video about how to create the rich cards then it would be appreciable. Which is preferred: the classic, inline structured data or rich cards? Or does it matter? Thanks for your comment Mike. However, this it’s an apple and oranges question: “classic, inline structured data” describes a syntax (either RDFa or microdata) while a rich card is a Google output format based on schema.org structured data (which can be provided in either RDFa, microdata or JSON-LD). If you’re asking which syntax you should use to facilite the generation of Google rich cards, RDFa, microdata or JSON-LD all work. If, however, you want to provide structured data that can be understood by other search engines as well, at this point I’d recommend microdata (although RDFa will probably also suffice). There’s no rich cards yet for music, but you may want to look at this Google pilot program for music actions. Having said this, even though it may not generate a rich card or rich snippet, there’s nothing preventing you from using schema.org/MusicRecording for such a purpose. Waw!. Great article. This article really helped me when I was little confused while reading about rich cards on Google forum. But if you have a specific question, rather than ask it here please direct it the Semantic Search Marketing Community group on Google+, or the Google Product Forums on structured data. In both cases you’ll benefit from the wisdom of more people than just myself. Do you know if the rich cards are available for products already as stated by Google? Well, at time of writing rich results are available for products at this time, but I’d be inclined to call them rich snippets rather than rich cards. Wow! I was wondering if rich cards was the same as rich snippets. Very comprehensive – now I understand better. From my understanding, rich cards seems mainly for recipe and movie kind of sites. Thanks Aaron. Thanks, Aaron. I’m working on a large ecommerce site. We’ve implemented ‘inline’ structured data into the product pages. Should I replace this with JSON-LD Rich Card format markup, or should I add this on top of the markup that’s already there? I’d go with whatever syntax is easiest for you, but I’d definitely use either microdata, RDFa or JSON-LD for your Product markup. That is, you should only declare the same entity with one of the supported syntaxes; I would definitely not add JSON-LD on top of microdata or RDFa. Further to my previous comment, if I include both JSON-LD format and inline structured data, the Structured Data Testing Tool shows two product entities on the page. Seems to me that you can do one or the other? Exactly: one or the other, not both. Rich cards was an SEO topic that I was confused about. Thanks for clearing this up in great detail Aaron, it’s much appreciated. Really Nice article with great helpful link, i had studied all the content with out-bond links and applied on my website knowledgetpoint.com. We can also apply Rich Cards through the Google Tag Manager and can track with the help of JSON-LD. Actually, I was confused about google Rich Cards and I understand it now. thanks so much! Hi Aaron, I need your thoughts about this. I found a niche where the first page listing sites are not using rich cards. Using them will set me apart from other sites, thus increasing my chances of ranking higher. Am I right? Cheers for the article, Aaron. We work with a lot of SMEs in organic search and it’s ridiculous how competitive certain industries have become. Without creatively implementing rich snippets and structured data, most businesses who don’t adapt will be left in the dust. I was looking for Guide of Rich Data Cards in Webmaster. Now I learning how to use “JSON-LD” for my project. I also faced the same problem….. If we want rich card for our website, we can pay any money to google or it is a free service? ?… Please clear my doubt . Thank you for your kind and useful information reply to my comments Aaron Bradley. Good blog and it is useful to many new comer. Learning how to structure a website, it never really made sense about rich cards and how I apply structured data appropriately. Glad I came across this post! Thanks for the help Aaron! Some time in Google searches Not show my website review stars I am using sahifa theme. can you suggest me best WordPress plugin for doing it better? Schema App is best-in-class, IMO. Awesome post Aaron! Very thorough info on Rich Cards, making it so simple to understand – a topic I was confused about when searching for specific queries, the Turkey example was great. Will definitely look into implementing this, thanks again. Hi my website is http://www.slsrecipes.com and I have implemented structured data last year and for most of the recipes I got first place in carousel and got decent traffic. But rich cards disappeared from March end onwards. I am trying so many ways but my rich cards are not showing. Please help me here. What is the issue here and what wrong I am doing. This help mean a lot to me. Hope you understand my situation. CookTime field is recommended. Please rate if available. The nutrition field is recommended. Please rate if available. The prepTime field is recommended. Please rate if available. RecipeIngredient field is recommended. Please rate if available. These are all recommended rather than required properties, so it won’t impact your ability to be awarded with recipe rich results (rich snippets). See more here. Very informative article but still I feel it can be explained in more simple language. Interesting – really need to add rich cards to my repertoire this year. I found a niche where the first page listing sites are not using rich cards. Well, structured data markup should be added to whatever page you hope to see appear as a rich result. (Rich) snippets and cards are search result features, so there’s no sense in which you can “add” or “make” a card on your site. Man… since all these \”cards\” have come out I\’m just now and still totally confused about what they are at times and how to use them. Youtube changed a lot lately with them, now I\’m having troubles getting my videos to link out to my properties again..
(yes you can link to your website from your YT video 🙂 ) … well at least you use to be able to. Next post: What's New with Structured Data and Markup?